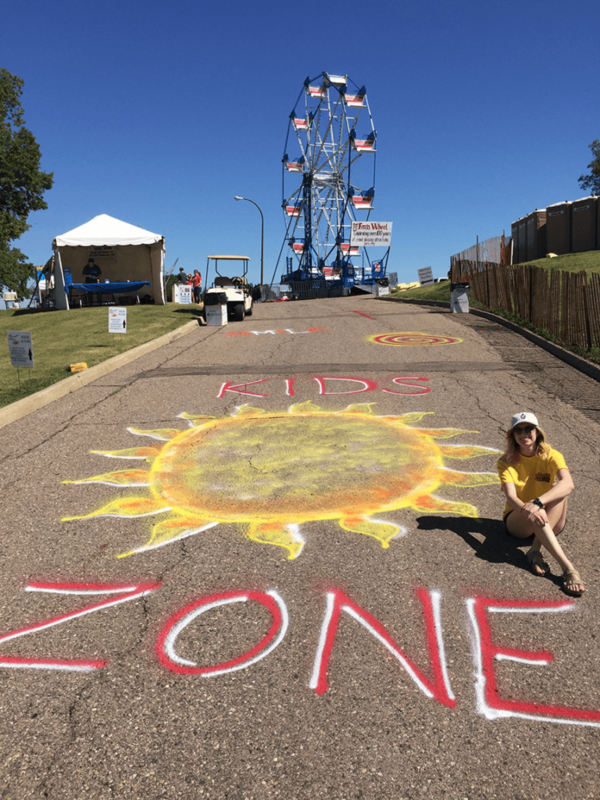 Every year, the Kid’s Zone is packed full of entertainers, inflatables, food vendors and face painters to keep kids of all ages busy all day long! All Ticket and Wristband Sales end at 7pm. **No refunds, exchanges or rain checks. New to the Kid’s Zone this year are Pony Rides! 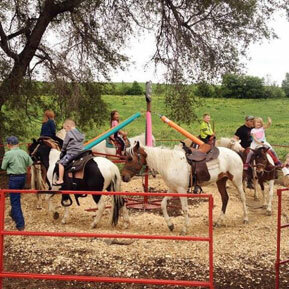 Allens Traveling Pony Rides are coming to Saturday In the Park. Started back in 2010, they bring the party animals to you! They have well-trained ponies. Who doesn’t love a pony ride? Come up and see us, next to the Meyer Petting Zoo. Rides will be $5 from Noon to 5. A pony ride will put a smile on your face! Bubbles!!! Who doesn’t love creating and popping bubbles!!! Come and experience a new feature in Kids Zone. 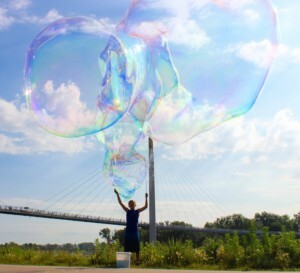 In-descri-bubble makes bubbles up to 50 feet long and enormously wide! 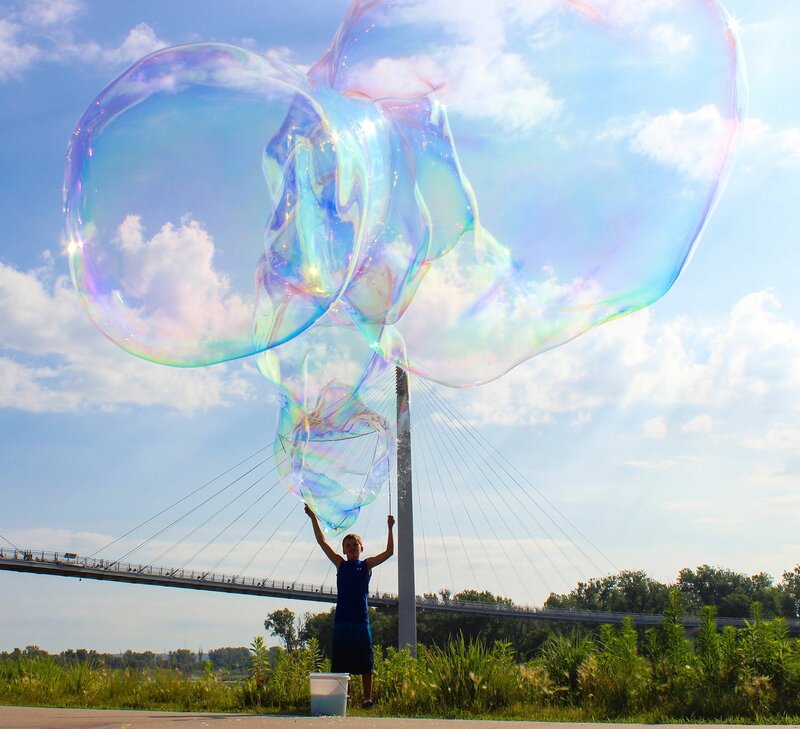 The bubbles are amazingly elastic and self-healing which enables you to actually blow bubbles inside of bubbles! Make sure you stop by and see how big of a bubble you can make! Join KCAU 9 Chief Meteorologist Fred Hexom for your chance to forecast the weather at Saturday in the Park. It’s your opportunity to see if you have what it takes to get in front of the camera and tell us if it’s going to be sunny, rainy or a chance of Thundersnow! KCAU 9 will be recording between 12 and 4pm and select people will be showcased on the KCAU 9 News that evening. Don’t miss your chance at doing Guest Weather with KCAU 9’s Chief Meteorologist Fred Hexom! A popular performer in the Rivercade/KCAU Kid’s Zone each year, Mr. Twister is back once again armed with fun and balloons! Mr. Twister’s wife, Ms. Twist, will also be joining in the fun. 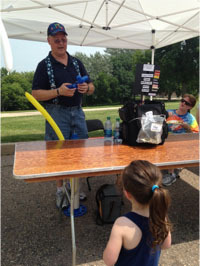 For the past 15 years, Mr. Twister has entertained children at Saturday In The Park with his wacky assortment of balloons. Make sure to bring the young ones up to visit Mr. Twister & Ms. Twist and ask for a FREE crazy balloon sculpture! The Petting Zoo is excited to be coming back again to the KCAU-TV/River-Cade Kids Zone. The Meyer Petting Zoo, a family owned business out of Holstein, Iowa, is bringing a pen full of cute, furry animals. The zoo consists of mainly farm animals. There will be goats, sheep, mini donkey, mini pony and llama. There will be babies for the kids to enjoy. Kids can buy ice cream cones filled with pellets to feed the animals for $1. Admission is FREE. 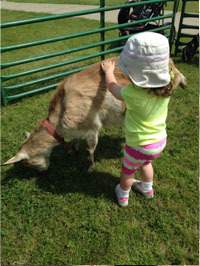 The petting zoo will be open from Noon to 5pm. 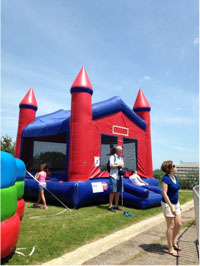 This year’s Kid’s Zone will feature inflatables to entertain kids of all ages all day long. Be sure to stop up to the Kid’s Zone to check out all of the attractions! Happy Faces face painting by Patti and friends has been coming to Sioux City for 25 years. 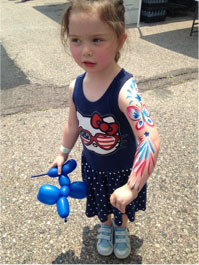 We provide face painting designs from $5 – $10. And, we even have temporary tattoos and hair coloring! We’ve painted the moms and dads that are now bringing their children. Moms want their children to have the same fun that they had years ago. Stop by the Kid’s Zone and get your happy face on!